As we get caught up in trying to get sewing projects completed and move on to the next one in the limited time available it is so very easy just to jump from project to project without giving any thought to whether or not we have the right needle in the sewing machine. It can be a costly mistake to simply use the same needle for everything you sew until it breaks. The size of the needle you use depends upon the size of the fabric yarns in the fabric. The finer the yarns, the finer the needle needs to be. In general, a needle should be fine enough to penetrate the fabric without marring it, yet have a large enough eye that the thread does not fray or break during the sewing process. Needle types related to fabric structure are sharp point (regular) for woven fabrics, ball point for knits, and wedge point for leather and vinyl. the yarns. This needle comes in sizes 9 to 16 and the larger the needle size, the more “rounded” the needle point is. The WEDGE POINT NEEDLE, which is designed for leather and vinyl, easily pierces these fabrics to make a hole that will close back upon itself. This eliminates unattractive holes in the garment, and also reduces the risk of the stitches tearing the fabric. The wedge point needle comes in sizes 11 to 18. The size 11 needle is designed for soft pliable leathers,while size 18 is designed for heavy or multiple layers of leather or vinyl. In addition to choosing the right TYPE of needle, it is also important to know the proper needle SIZE for the type of fabric being used. As a general rule you can utilize the following fabric category/needle size information when choosing the needle for your next project. DELICATE fabrics such as silk, chiffon, voile, fine lace and organdy would need a fine “size 9” needle. LIGHTWEIGHT fabrics such as synthetic sheers, batiste, taffeta, velvet, stretch fabric, tricot and plastic film would need a “size 11” needle. MEDIUM WEIGHT fabrics such as gingham, poplin, linen, muslin, chambray, wool crepe, flannel, knits, jersey, wool, chintz, satin, raw silk, wool suiting, stretch fabric and drapery fabrics would need a “size 14” needle. MEDIUM-HEAVY fabrics such as sail cloth, gabardine, heavy suiting, tweed and heavy drapery fabrics would need a “size 16” needle. HEAVY fabrics such as denim, overcoatings, ticking, upholstery and canvas fabrics would need a “size 18” needle. One final needle pointer is always replace dull, bent or nicked needles. If you hit a pin, you should immediately change the needle. A bent needle, even if only “slightly” bent or nicked can cause skipped stitches and can easily cause damage to your fabric by tearing the fabric yarns. I have a couple of grandchildren that are begging me to teach them how to sew. They are 10 years old, and that’s about the age I learned to sew on my mothers’ treadle sewing machine. The problem is that my sewing machine is BUSY with all my sewing and craft projects, so I’ve been checking around to see what I could get that wouldn’t be too difficult for them to learn on. Here’s what I’ve decided on – the Brother CS6000i. It will be easy enough for me to show them various items then get them started on easy projects. Here’s the best part: Price is $144.99 (List price $440) AND Free Shipping!! If you also need an excellent book to help you with your teaching, we recommend the “Learn How To Sew” book. The book covers the “learning” aspect from start to finish — and gives practice pages to practice stitches (sewing a straight line, sewing in a circle), as well as a number of easy sewing projects that the beginner can jump into. The bobbin winder unit may be located on the side of the sewing machine or on top of the machine or some types have the rewind right in the machine. Regardless of “where” you wind the bobbin, there are some general rules that apply to every bobbin on every machine. ** Always start with an empty bobbin. Never wind one color over another color. ** Check the bobbins frequently to insure there are no nicks along the edge (which would have happened when the machine jammed or you broke a pin while sewing). If there is a nick or the bobbin doesn’t roll smoothly on the sewing table, discard it immediately because it will cause future sewing problems, such as breaking thread and jamming in the bobbin area. ** Be sure to use the RIGHT bobbin for your machine. If you’ve gotten some bobbins from another person, or perhaps extera bobbins from a machine you’ve bought, double check to make sure the bobbins are the correct type your machine calls for. ** Choose thread for the project that is identical in color and type as the one to be used for the upper thread. ** Wind the bobbin evenly across and in level layers. The following illustration shows the “right” and “wrong” way to fill a bobbin. ** Don’t wind the bobbin so full that it would be tight and hard to insert into the bobbin case. Most machines have an automatic “shut off” when the bobbin gets full, but if yours does not, be careful not to fill it too full. ** Keep the lint out of the bobbin area. Lint and broken or frayed pieces of thread accumulate in the bobbin area, and can cause problems with sewing, so be sure to keep that area cleaned out. ** It is good to have extra bobbins on hand so you won’t be tempted to put one color thread on top of another color. In addition, if you’re going to be involved in a rather long project that will require a lot of thread, such as quilting, or perhaps something that will need a lot of “satin” stitching, it would be a good idea to fill 2 or 3 bobbins with the thread that you’ll be using for the project so you won’t have to stop in the middle of the project and start filling bobbins. 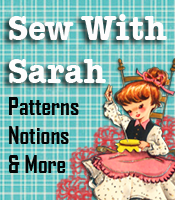 Bobbin Basics is an excerpt from the Learn How To Sew book as well as in the Sewing Machine Repair For The Home Sewer book. How Close is Your Nearest Fabric Shop? One of the most irritating things that can happen to those of us in the sewing, alteration, crafting, doll making and other “sewing” businesses is for a machine to break down in the middle of a rush project — or any other day of the week! We simply do NOT have the time to spare to lug the machine to a repair shop, only to be told it will be a week or two before they can “get to it” to check it out and make necessary repairs. Not only do we have to wait for the machine to be repaired, in most cases the repair COULD have been done easily and simply by YOU or me at our own home or shop, which would have resulted in almost no down time. I learned a long time ago that unless you have a totally honest repair shop, and an efficient repair shop, you can look for long delays in getting the machine back, and THEN within a few days or weeks the same (or different) problem pops back up. Interesting how “new” problems seem to happen so quickly after a visit to the repair shop. For those of you who are like me and NEVER want to see my sewing machine leave my sewing room again, I would highly recommend a couple of repair books that are written in simple language, with diagrams and illustrations, that will allow you to repair your own machine, and get right back to work on those projects. Sewing Machine Repair for the Home Sewer is probably the most helpful repair book you can find – it tackles the timing problems (have you hit a pin or heavy thick jeans seam and thrown it out of time? ), shows how to take a tension apart and put it back together and gives great information on how to adjust the tensions (upper and lower). And, oh those pesky problems with the needle and bobbin – thread breaking, knotting in the bobbin area, etc. This book covers all of these problems. And, for those Spanish speaking sewers, there is also the Sewing Machine Repair for the Home Sewer written in Spanish (Reparación de Maquinas de Coser en el Hogar that is also available. Serger Repair for the Home Sewer is written in the same manner that the sewing machine repair book is, except that it tackles the problems and issues that you’d have with your 3-thread, 4-thread and 5-thread sergers. And for those of you who are lucky enough to have a treadle sewing machine, don’t forget to keep them in tip top shape as well. By doing “regular” preventative maintenance on our precious sewing equipment will mean fewer breakdowns and fewer headaches while we’re doing what we love to do — sewing!